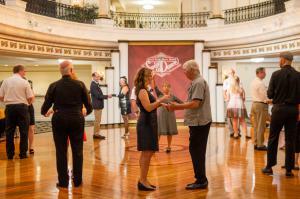 CLEARWATER, FLORIDA, USA, November 1, 2018 /EINPresswire.com/ -- On Thursday October 18th, the monthly Swing Dances for Charity kicked off the 2018-2019 season in the Fort Harrison’s Crystal Ballroom in downtown Clearwater. The dance floor was packed and the spirits high, but more importantly, funds were raised for Bee’s Learning, a mobile tutoring program in St. Petersburg. The Fort Harrison is the international religious retreat for the Church of Scientology Flag Service Organization, who sponsors this monthly event.